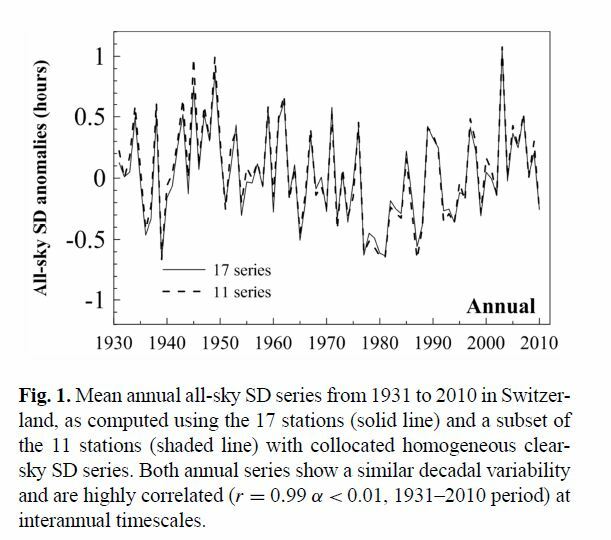 solar radiation of the order of ∼20% over the last decade." Clean air legislation really got going in the late 1970s. Read the rest at The Hockey Schtick. As I’ve said numerous times, clean air legislation has cleaned the air, meaning less sunshine is reflected back into space, and more sunshine reaches the ground and causes warming. The Hockey Schtick has found another paper showing sunshine is way up in Spain. And more sunshine means warming. I have other blog posts on the subject here. 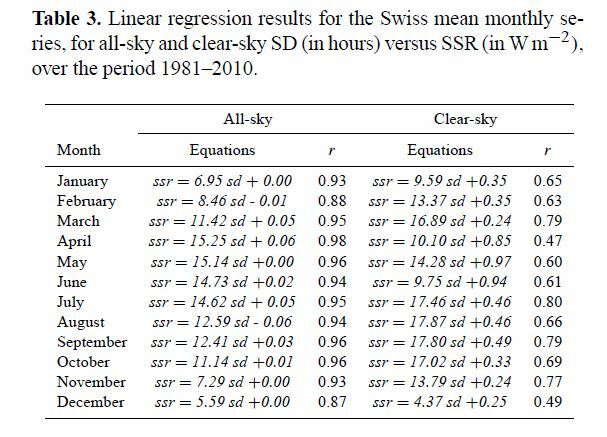 All-sky SSR has been fairly stable with little variations in the first half of the 20th century, unlike the second half of the 20th century that is characterized also in Switzerland by a dimming from the 1950s to the 1980s and a subsequent brightening. Does this graph of Sunshine changes look like the temperature changes graphs? The effect of CO2 doubling is supposed to be 3.7W/m^2. In this table, changes in sunshine from 1981 to 2011 produce 5.59W/m^2 in December to 15.25W/m^2 in April.